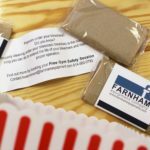 There is a reason we gave away popcorn samples at all of our trade shows this year – each one had a reminder inside to clean under the bleachers, the number one preventative maintenance tip we share. 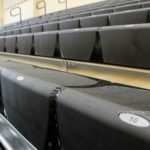 Whether its food, soda, or dust and debris, all have an impact on the operation of your telescopic bleachers. Known as the bearing surface, the space underneath your telescopic bleachers in both the open and closed position. Often, cleaning up the mess after a big game means to close the bleachers and clean the floor where debris fell through. 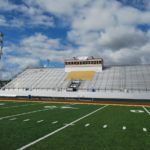 This is a good start, but you have to also beware of what lingers on the bearing surface where the bleachers sit in a closed position. This is where dust and debris tend to collect. The most obvious reason to clean under the bleacher is for sanitary reasons, from food, soda, wrappers, and dust this is a breeding ground for bacteria. The sometimes not so obvious reason: It can do some major damage to your understructure. The dust and debris can cause a domino effect with damage to the drive wheels that will impair tracking and alignment and this type of damage isn’t covered under your warranty because it is 100% preventable. When you are closing power bleachers, row one goes under row two and pushes both under row three and then pushes all three under row four and so on getting heavier as they go. 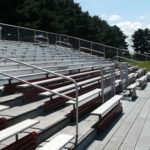 Once you have all of the rows closed under the others, except the last row or two, is when the bleachers begin losing their traction and need your assistance to close all the way. This is where the dust is causing the drive wheels to lose that traction. Now if it happens much before that, your wheels have picked up too much dust and are spinning in it creating a glazed smooth drive wheel instead of a gripping tire. Your bleachers automatically realign themselves by closing completely and opening completely. When the bleachers loose traction and do not close completely and they are then opened, they do not come out straight. Coming back out, the portion that did not close all of the way has a head start and is ahead of the other sections that did close. This can, and does, bend the structural components and can even break them to the point that they need to be replaced. Note: A bleacher inspection that does not include the inspecting person opening and closing your bleachers is not a complete inspection. You would be amazed at what can fall through tiny openings. 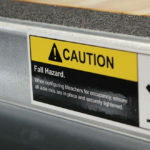 Even though unauthorized access to the understructure is prevented with wall-to-wall bleachers, dust still gathers and will build up on your drive wheels. Make cleaning the bearing surface part of your routine schedule and clean under the bleachers in the open position, clean where the bleachers sit in the closed position, then close the bleachers. Don’t cheat and close the bleachers then flip up the skirtboard and sweep between everything, this will leave more dust and debris where you do not want it the most. David DeCan, Lead Service Technician shares best practices when it comes to cleaning the drive system and under the bleachers on a reverse fold telescopic bleacher.